I love shopping at the Aldi Grocery Store! It is my go-to grocery store for many different items, but not for everything. 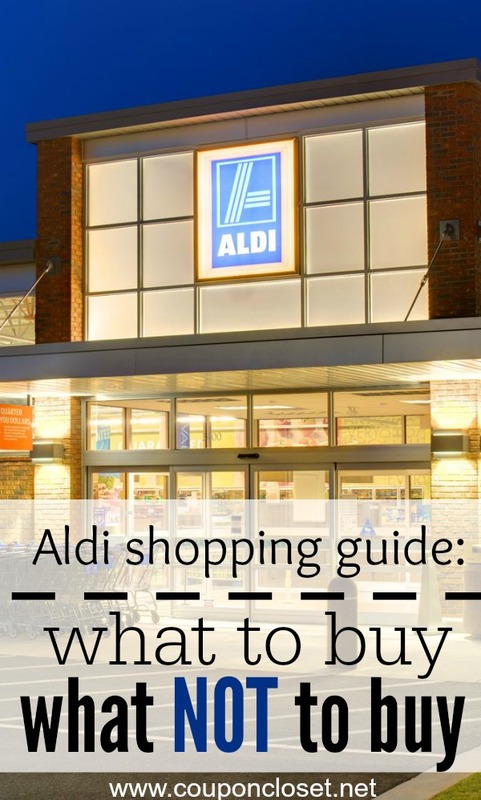 I wanted to let you know what I like to buy at Aldi (and what I avoid buying). Yes, there are plenty of great deals, but there are also things I never buy at Aldi. Most Aldi stores are set up in the same configuration, so let’s “walk down the aisles” and figure out what to buy and what to by-pass. I love the Aldi Brand (Clancy’s) tortilla chips and pretzels. They are usually price just over $1 and they taste great. My kids like their Cheese Curls and Cheese Puffs as well. 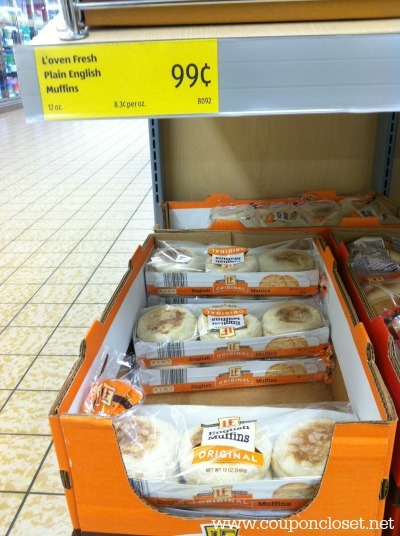 They are normally priced around $1, which is a great price. If you like Fritos, check out the Aldi corn chips. They taste like the real deal and are priced under $1. Aldi flour and sugar are usually very competitively priced. 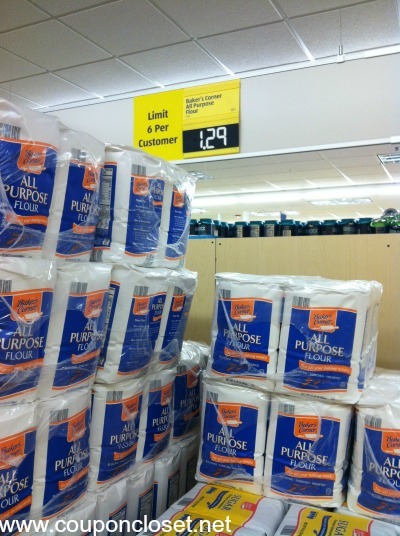 Flour can be found for just over $1 and sugar for about $1.50. Other baking materials – baking chips, seasonings, baking cups, etc. I don’t tend to buy these items at Aldi because I know I can get them for a similar price or cheaper at the grocery store. 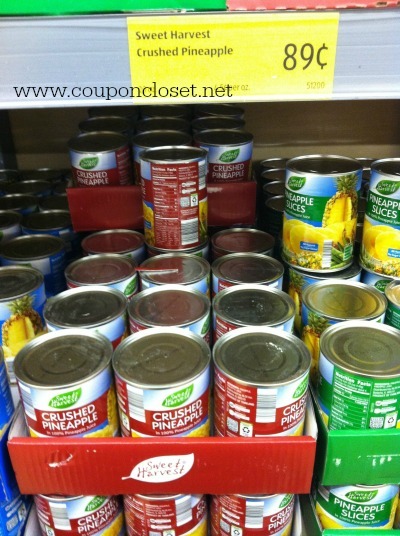 Canned pineapple and beans are cheap at Aldi. They taste like the real deal, so I like to buy them. You can also find ketchup, mustard and salad dressing comparably priced to the grocery store. I haven’t bought these before, so I cannot attest to how they taste. I don’t buy canned vegetables just because I like to stock up at the grocery store when I can buy them for free or cheap with my coupons. I buy just about any and all produce I can get my hands on at Aldi. I have not had one bad experience with their produce Be sure to be on the look out for their “Produce Picks” which are the lowest prices of the week. Aldi also has a double guarantee – if you are unsatisfied with your purchase, not only will they refund you purchase price, but you will also get a replacement item for free. This is basically a risk-free purchase. Note: Aldi has some Organic, but they don’t carry a lot of Organic produce options, but the produce they do carry is fresh and in season. Nothing really in this department – Their produce is awesome. If you are only going to buy one thing there, then buy the produce. That alone will save you money. You can find milk, eggs, butter and yogurt very nicely priced at Aldi. Their prices on these items are hard to beat at any other store (though you can find comparably priced milk and yogurt at Crest Market, locally). I don’t buy cheese at Aldi because I can get it cheaper from Sam’s or from the grocery store (like Crest and Homeland) when it goes on sale. Honestly, I don’t buy very much meat at Aldi. What I do buy is their ham. Aldi ham is usually priced cheaper than anywhere else and it tastes great. I don’t buy beef, chicken or pork at Aldi, because I can buy it cheaper at Sam’s or other grocery stores. You can find lunch meat at a decent price, but I have never tried it because I can usually match or beat the Aldi price with sales and/or coupons at a grocery store. I don’t buy any prepackaged baked goods or bagels. They are not any better of a deal at Aldi than any other grocery store. Aldi’s frozen fruit tastes great and is priced well. Besides that, we haven’t really bought many other frozen items from Aldi (so I can’t attest to their quality). We have tried their ice cream (in the tubs) and it just has a different taste than the typically ice creams we like. I wouldn’t say its bad, its just different. We don’t care for it so I don’t buy it. The dried beans and macaroni and cheese are priced great at Aldi. Now, the macaroni and cheese does not taste like the “blue box” macaroni, but my kids like it just fine and since it only costs about $0.40 we buy it! The rice is not priced high at Aldi, but I can usually get it for cheap or free with coupons so I buy my rice at the grocery store (Homeland). I buy the large kitchen trash bags. I can typically get an 80-count box for as much as a 30-count box at the grocery store. I have not priced the toilet paper or paper towels at Aldi because I typically get a better price from Amazon (plus it gets shipped to my door for free). There it is, in a nutshell. I know this is by no means an extensive list, but I just wanted to give you a basic run down of what I like to buy and what I prefer not to buy at Aldi. 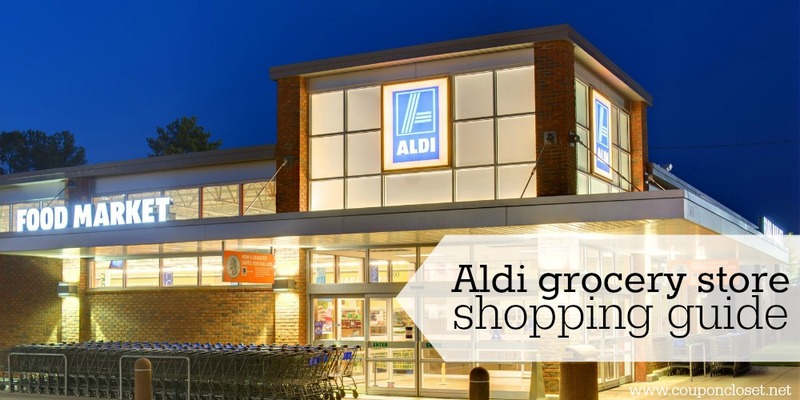 If you have never shopped at Aldi and are curious how it works, have a look at our Aldi Foods – 4 Things You Need to Know Before You Shop. 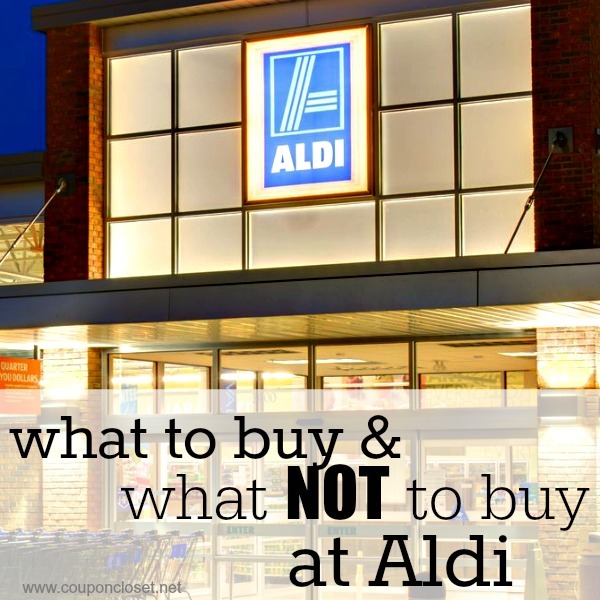 In this post we talk about the basics of Aldi. If you’ve never shopped there, this is a great post to read. What are your favorite items to buy at Aldi? Come back and share it with us – we’d love to hear from you. We have tried the ketchup and it does NOT taste as good as the national brands! Guess we’re spoiled! I love Aldi but I don’t buy their frozen foods anymore. I’ve been disappointed more often than not. Everything else is great there. I really like the chocolate at Aldi because it is European chocolate–you can’t get it for a better price anywhere. Great tip – Thanks Debbie! I buy just about everything at aldi… The chocolate is the best. This company originated in Germany and I believe is owned by the trader Joe’s folks. We have been happy with 98% of products they carry. I have 3 growing sons and our cupboards are always stocked thanks to aldi…I figure we save $300/mo. Over cub. I am always grateful to have found this store years ago. There drum sticks are great, I also love there organic frozen rice but a little costly there! I haven’t been to Aldi, but thanks to your comments that’ my next stop for grocery shopping. I shop at Aldi’s here in the metro Detroit area and in Europe when I was there. The European Chocolate bars that Aldi’s carries is fabulous. It’s not a name brand chocolate as it is imported, you can get milk Chocolate, Dark Chocolate or Milk Chocolate with Almonds. It is a LARGE bar and sells for about $2.50. Creamy & well worth the $$$. Better priced than any chocolate of that size in the states! 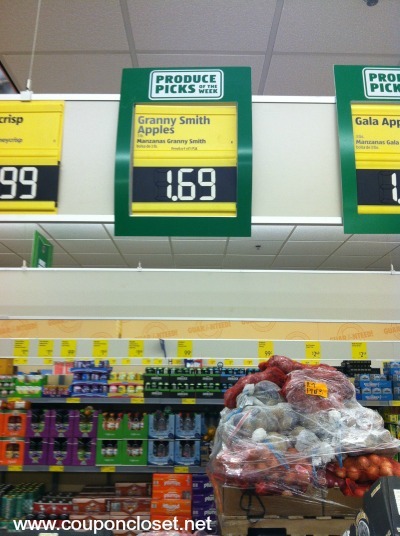 Big fans of Aldi produce. However cheap bananas sometimes go bad earlier than Crest’s. Best if you’re only buying 4-5. Sometimes milk has gone bad before expiration date. Have better luck with comparably priced Prairie Farms at Crest. Forgot the whipped topping is cheaper than Cool Whip even on sale anywhere unless you have a coupon. I buy Aldi’s chunk cheese and it is very good at 1.79 for 8 oz i find it hard to beat the price at local grocery stores. I also buy frozen hash browns they are just as good as Ore Ida and are cheaper. 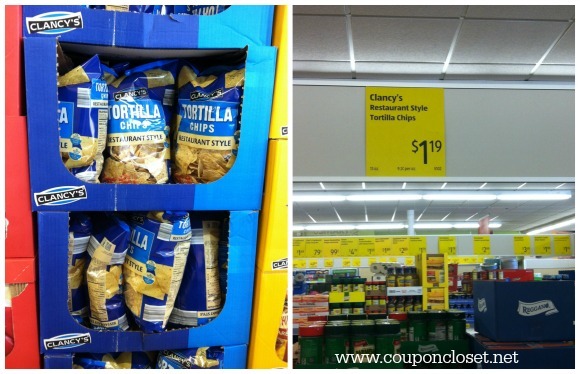 However if local stores have a good sale and i have coupons i choose the name brand only because it will be cheaper. One other thing that i buy is Aldi’s cat food. The 16 pound bag is great price at 7.99 barn cats and the spoiled house cats love it. I love Aldi! You need to try the chocolate because it is amazing. Also the tortilla chips in the clear and red bag are like the ones you get at a restaurant. 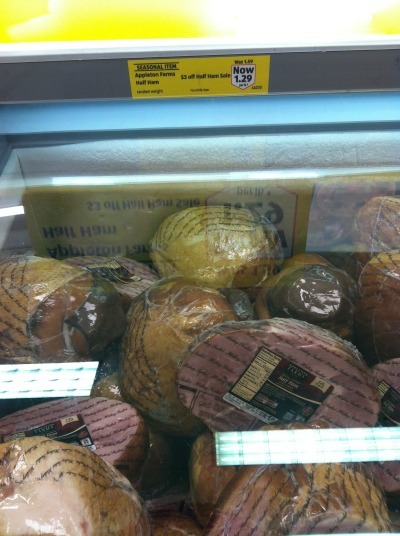 I also found chicken breast that are stuffed in the frozen section for 1 for $1 or 2 for $2. They are just as good as the name brand ones at the store and so much cheaper!!! Also dont always look past the meat. 75% of the time I can find cheaper but sometimes i find some really great meat on sale there.